Julie Rose Sews: dad's birthday. Today is my dad's birthday. He would have been turning 57. One of my favorite memories of my dad actually happened over the phone. I was walking down 8th Avenue, talking to my dad on my phone, and it was right around this time of year, because we were talking about his birthday. He said, "I went this whole year thinking I was going to be turning 56, but when I said that to your mom, she said I was only going to be turning 55! I did the math, and she was right! How about that? I just turned a year younger on my birthday." I miss my dad so much every single day. There are days when it's almost impossible to deal with having lost him. I've been trying to deal with it in part by living in a way that he would be proud of and following the wonderful example that he set. 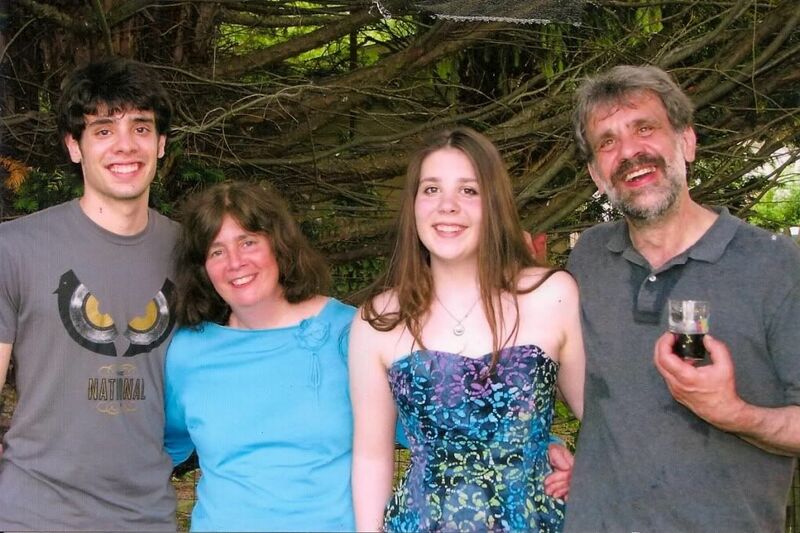 One of the things that stands out most to me was how openly he expressed how much he loved his family. Pretty much every time he saw one of us (which was a lot, because my parents worked at home, something for which I'm extremely grateful), we'd get a "Love you, Hon," (to my mom,) "Love you, Bud," (to my brother,) or "Love you, Jules" (to me). One of the things that has comforted me most since losing him is the knowledge that there was absolutely no doubt about how much we cared for each other. I'm never going to have to look back and say "I wish I had told him I loved him more often." This is from my high school graduation party, one of my very favorite memories. That's what I'm trying to incorporate into my own life-- letting people know that I care about them, and that they're special to me, and never to take anyone for granted because life truly is too short for that. So if I can make a little request of you, my dear and sweet readers who have given me so much support over the past year, I would request that you help me celebrate my dad's birthday by finding someone who is special to you and telling them how much they mean to you. Let them know that you're there for them, and that your life is enriched because they are in it. 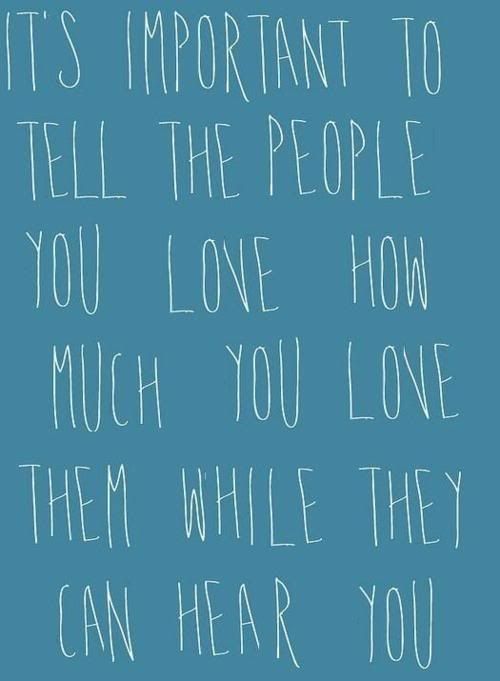 Tell them you love them while they can hear you. You are such an amazing strong woman! I truthfully do look up to you in many ways! I think the best thing about the word "family" is that it doesn't have to be blood related. Family truthfully means someone who you care for and love. The best thing in life is when you tell people you love that you love them everyday...multiple times a day at that! Everything you said here is so true and so touching! Keep on smiling! You truthfully brighten up people's days even if you did not realize it!! Oh, Rachael, that was so incredibly sweet of you, thank you. I'm so glad that you were my resident. You are such a special person, and you always brighten up my day, too. His picture is on my bulletin board, on my desktop, and in my heart. We will never forget him. Thanks so much for the comment, Ford-- I know my dad (and the rest of us!) always got a big kick out of your sense of humor. Thanks Julie for reminding me how much we need to let those we love know it!!! I know I will try harder!! thankful that our Marissa was blessed with such a good friend in you.....hope to see you sometime this year.. I would love to see all of you! I'm so lucky to have Marissa as my best friend, she has been so wonderful through this year. Oh Julie, this is a wonderful post. It actually made me tear up a bit because sometimes it takes someone else saying it to make you realize and remember how important it is to make sure that you show others how much you care and love them. Thank you so much for your kind words, Theresa. Your comment made me tear up a little, too. :) I'm so glad this post seems to be sending just the message I'd hoped it would, and that it's impacting people positively even though it stems from something devastatingly sad. I've been stunned every step of the way at how wonderful and caring the blogging community has been. My heart goes out to you, Julie. I can't begin to imagine the pain you've gone through but you seem so strong and clear here. Happy birthday to your father. Thank you so much, Lisa. It's been very rough, but at this point, there isn't much I can do besides trying to honor his memory by emulating his sweet, caring nature. Karla, what a wonderful comment, thank you. My Dad was an amazing father, I've never met anyone with such a capacity for generosity, caring, and sweetness, not to mention his wonderful sense of humor. Your comment made me smile even during a sad time. I'm so grateful that blogging has given me the opportunity to form friendships that never would have happened otherwise.